H.E. 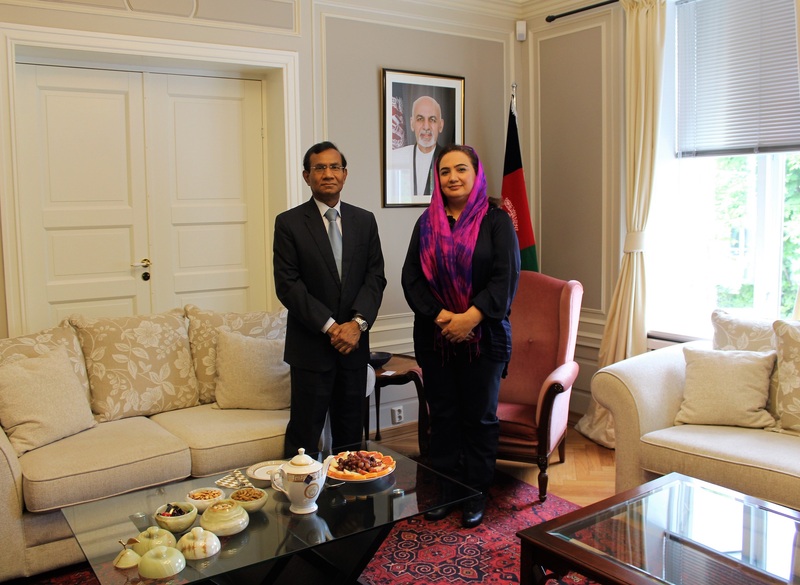 Mrs. Shukria Barakzai received a courtesy visit from newly appointed Ambassador of India to Norway, H.E. Mr. Krishan Kumar. The two Ambassadors discussed common interests and bilateral relations between India and Afghanistan as well as fostering close cooperation between the two countries. The ambassadors mentioned that the relationship between the two nations is firmly established on the historical and cultural ties. The people of the two countries have had trade and cultural relationship that goes way back in to ancient civilizations. Ambassador Barakzai underlined the importance of this relationship and wished for further expansion of the bilateral and people-to-people relations between the two countries.